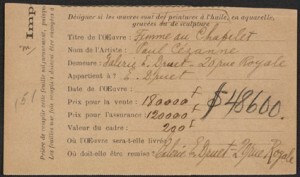 The painting was lent to the Armory Show by French dealer Emile Druet, who listed the work for sale at $48,600 – by far, the highest asking price for any work in the exhibition. It was reproduced and sold as a postcard, and traveled to both the Chicago and Boston venues. Martin Davies, and Cecil Hilton Monk Gould, French School: Early 19th Century, Impressionists, Post-Impressionists, etc. (London: National Gallery, 1970), 20. John Rewald, Cézanne and America: Dealers, Collectors, Artists and Critics, 1891-1921 (Princeton: Princeton University Press, 1989), 200. Joachim Gasquet, Cézanne (Paris: Éditions Bernheim-jeune, 1921), 66-67, 82; quoted in National Gallery London, Catalogue of Acquisitions 1953-1962 (London: Publications Dept., National Gallery, 1963), 16. Guy Pène du Bois, “The Spirit and the Chronology of the Modern Movement,” in Arts & Decoration (March 1913): 154. Charles H. Caffin, “International Exhibition and [sic] Modern Art Opens Tuesday,” New York American (February 17, 1913): 8. Theodore Roosevelt, “A Layman’s Views of an Art Exhibition,” Outlook (March 29, 1913): 718.